Shoreline Area News: For the Birds: Is that bird coming, going, or staying? For the Birds: Is that bird coming, going, or staying? Longer daylight hours and warmer weather (hopefully), has started this year’s bird migration here in our neighborhoods. Flowering Red Currants have started blooming - one of the two primary nectar sources (Salmonberry blooms are the other) that the majority of Rufous Hummingbirds use to help fuel their northern migration, often as far as Alaska. Earlier this week I heard and found my first of the year White-crowned Sparrow, singing out on a leafless limb near a parking lot - I fondly call these birds Parking Lot Serenaders. 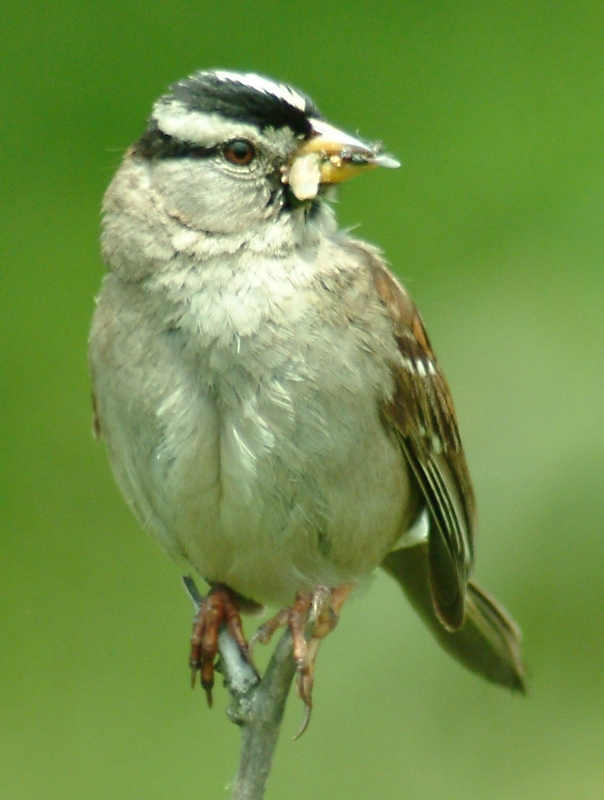 These sparrows come back from their southern wintering grounds to breed and raise their young in our climate-friendly locations. The females build their nests in nearby bushes. It could be that parking lots have fewer cats and raccoons, thereby reducing the cost of predation. Our resident birds have started singing their mating tryouts — Song Sparrows, Bewick’s Wrens, and Spotted Towhees are in full song. Black-capped and Chest-backed Chickadees have changed their winter calls into their nesting songs. In my yard, these, plus Dark-eyed Juncos, appear to be paired already, and the Anna’s Hummingbird females are busy pulling nesting cotton and hair for their tiny little nests. 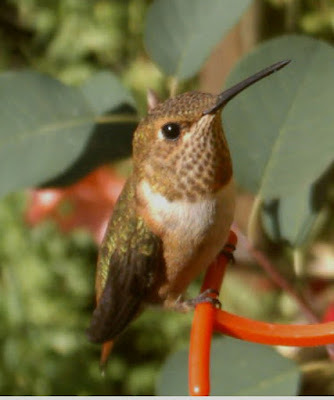 I expect to start seeing bumbling Anna’s juvies learning the secrets of hummingbird feeders, sticking their shorter bills haphazardly into the feeder, tying to get to that sugar water. Just this week, I heard and saw a Pileated Woodpecker sounding out his territorial markers — one tree was real loud, one not so loud, and one even less-loud (sort of like the three beds — one too large, one too small, and one just right). during migration -- they breed higher further north. He has returned repeatedly to the middle-sound-producing tree trunk. 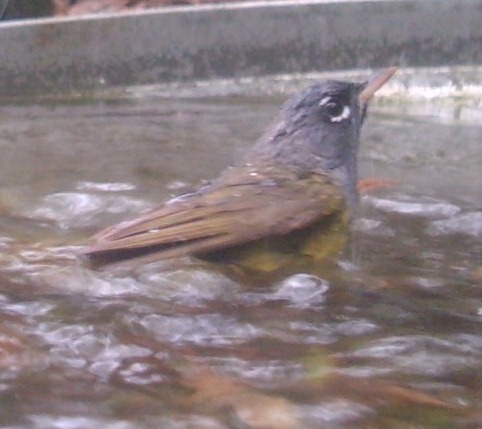 You may start seeing birds that will be passing through, stopping for a quick sip or dip of water, rest, and refuel before continuing to their preferred breeding locations. Birds you might see: House Finches, Purple Finches, rarely a MacGillivray’s Warbler, and/or perhaps two different flycatchers — Willows and Olive-sided. Willow flycatchers breed near wetlands and require shrubs and trees from which to dart out to catch insects. Olive-sided Flycatchers are in decline, mainly due to loss of habitat — they favor tall trees, usually with open or dead tops for their fly-catching. Other birds that that you will probably see: Yellow-rumped Warblers, Townsend’s Warblers, Downy and Hairy Woodpeckers, and Bushtits. Keep looking in your yard. 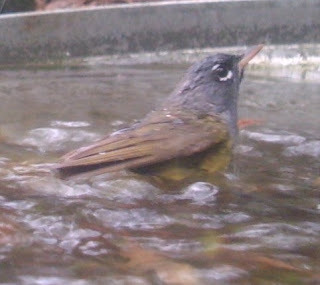 If you have native plants, and especially dripping water you may be surprised at the birds that stop and rest in your yard.